Exhibitors, get complete info HERE. Happy winners of our Rollga giveaway. One of the race amenities is the Expo and Packet Pick-Up on Saturday, October 12 from 10am-5pm. Once again, the expo will be at the Albany Capital Center. The free admission expo is the only packet pick up opportunity for runners and it’s also open to the public. 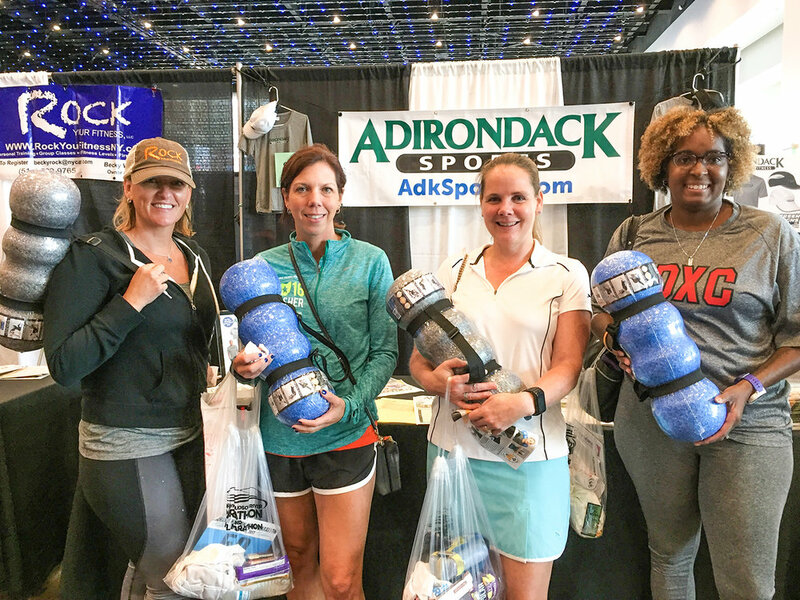 The show has been expanded to allow for more vendors and more options for runners and their families to shop, learn, sample from a variety of running, health, fitness and summer/winter sports vendors. The bright, open convention space is an inviting venue for enjoying the camaraderie with fellow runners, visiting the exhibitors, purchasing gear/clothing and sampling food. Exhibitor categories include running, health, fitness, nutrition, travel, skiing, snowshoeing and green living. The expo is open to all runners, their family and friends and all are welcome. GreenLayer Sports will be selling race merchandise, such as shirts, jackets and race branded items. IllumiNITE will be selling their reflective clothing and accessories for runners, cyclists and triathletes. Tomhannock Bicycles will have two models of their ElliptiGO stand-up bikes for you to try before you buy. Other vendors include the Ottawa Race Weekend, Bondi Band, Power House Athletics, Dion and NeviTrek Snowshoes, TT-Pin! muscle therapy and Back in Balance’s Normatec recovery treatments. New this year are RunLites accessories, Run 26.2, My Soxy Feet and more. Sign up for races such as the Peak to Brew Relay, CF Stair Climb, Troy Turkey Trot, Stockade-athon, and Shen Vets Day Dash. Bring your lightly worn running shoes to the expo. Drop off bins will be available at the entrance. All shoes will be donated to Dunk Your Kicks, a fundraising program of The Max Cure Foundation. The foundation collects gently used sneakers and recycles them as affordable footwear in developing nations to raise money for families battling pediatric cancer. MCF receives payment from the recycler up to $1 per pair based on the quality of the sneakers collected. We will also collect non-perishable food items for the Food Pantries for the Capital District at the expo. Please bring cans or boxes of non-perishable food to help the hungry in our region. The Food Pantries is a coalition of more than 60 food pantries in Albany, Rensselaer, Saratoga, and Schenectady counties. They provide funding, delivery, coordination of services and food drives, and education and training to member food pantries.